The number and variety of piano course books available means choosing one is a bit of a minefield. 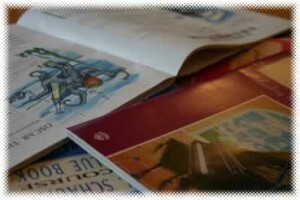 Among the most popular are the John Thompson series, the Usborne piano books, Chester’s piano course, Pauline Hall’s Piano Time books and (aimed particularly at adults) Pam Wedgwood’s It’s Never Too Late to Play Piano tutor book or The Classic Piano Course … and there are a great many more besides. (To help you decide which piano course book to choose, visit piano course books at Musicroom.com or Amazon UK/Amazon US, where you can compare customer star ratings and read detailed reviews). If I’m honest, the main reason I chose the piano course books I work from – The John W Schaum series – was that they were the ones I’d learned from as a child – way back in the 1970s (albeit updated and made a little more visually appealing). As my confidence as a pianist and, in the initial stages, as a teacher – was severely lacking, I felt the need for some familiar material to give me security. Although it was 30 years earlier when I’d first met these books, I still remembered which pieces had been the most enjoyable and – perhaps more importantly – which had proved the most challenging and why. Familiarity may not seem the best reason for favouring one set of books over another – but it’s probably not the worst either. I suppose in an ideal world, you would buy a wide selection of course books, try them all out and decide – along with your ‘guinea pig’ which appeared to have the best results. However, I think the best piano lessons have far more to do with the teacher and the way he or she gets the point across than with the books used, so the difference may actually end up being negligible. I have, unintentionally, had some experience of teaching from beginners books other than the Schaum series. This is mainly through pupils who have left another teacher to start with me. (In these cases I try to stick with their original books wherever possible, to save their parents extra expense). I’m probably biased, but I still haven’t come across anything as good as the Schaum books: many expect too much of pupils in the early stages and the progression does not always follow a logical path. The worst culprits are the adult learning books which often introduce very complex rhythmic patterns, long before the adult learner feels confident with simple crotchets and minims. I did experiment with one adult learning book recommended to me (not the Schaum one, as it happens although I have since discovered there is a John W. Schaum Adult Piano Course). However, I found my adult learners were totally confused by these complex rhythms and became frustrated when each new piece took so long to learn. For this reason I now use the John W. Schaum books for all my new pupils and, although I apologise to adults for the ‘childish’ nature of the books, I have never found anyone who is offended by my choice. (I recently used the same strategy for myself when attempting to learn a new language: the books and courses aimed at children were by far the most useful). The first book in the Schaum series is Pre-A the Green Book. There are actually nine books in this series but I rarely teach beyond the third book – B the Blue Book – or very occasionally the fourth – C the Purple Book – as, by this point, pupils have started working towards exams or veered off into other directions such as favourite classical, pop or jazz pieces. The Schaum series is American in origin and some Brits may feel alienated by the Americanisms – while others see the books as too old-fashioned. However, on the positive side, they are clearly laid out with large notes, appealing colour illustrations, and songs with memorable (if slightly twee) words. Most importantly, I feel, they encourage gradual progress in a logical order – firstly separate hands playing in a ‘C major hand position’ with simple (mainly crotchet) rhythms, then one hand followed by the other, then gradually introducing quavers, sharps and flats, playing hands together and different hand positions. By the end of the first book, pupils will be able to play (in a piece called The Detective) a combination of sharp notes, flat notes, notes played with hands together and staccato notes, as well as being able to move the left hand to and from different positions. This is a fairly complex set of skills for a beginner to manage, yet because the progression towards this is dealt with at an achievable pace, most do not find it too daunting. There is also a short quiz (‘true or false’) at the end of the book to remind learners of things they should have picked up along the way (such as tied notes and rests). The only change I make to this quiz is to exchange the word ‘bar’ for ‘measure’ and ‘eighth notes’ for ‘quavers’. (The book refers to semibreves as ‘whole notes’ and all other note values as a fraction of this whole). I tend to ‘cheat’ a little with this quiz as – although I always start by asking my pupil for his answer – I make sure he only writes down the correct one in the end – just in case he ever looks back over it for revision purposes. 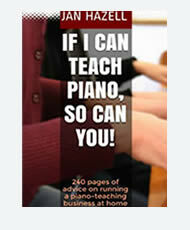 Of course, some piano tutors prefer not to bother with piano courses and start their beginners off with brightly coloured books full of piano songs for kids. There is a series called Easiest 5-Finger Piano Collection, which offers a wide variety of familiar music for kids including Children’s Favourites, Chart Hits and Best Known Nursery Rhymes. While I have nothing against these books, I think they should be used as ‘extras’ and they are no substitute for a proper beginner’s course which teaches the learner in stages – and ensures that they are reading the notes rather than making musical ‘guesses’ because they happen to know the tune. Also if a learner begins with well-known tunes, he’ll be very reluctant to veer away from these and learn, for example, exam pieces. Perhaps I should mention at this point that, although the theory of music has to be referred to in some way, I do not teach formal music theory until a student has passed his grade 4 exam. Not all teachers would agree with this and many start students off with a grade 1 theory book to accompany their course book. In my experience, pupils find this too much like schoolwork or homework and prefer to spend the whole lesson actually playing the piano. (For more ideas of piano books and sheet music to buy see Between Exams).